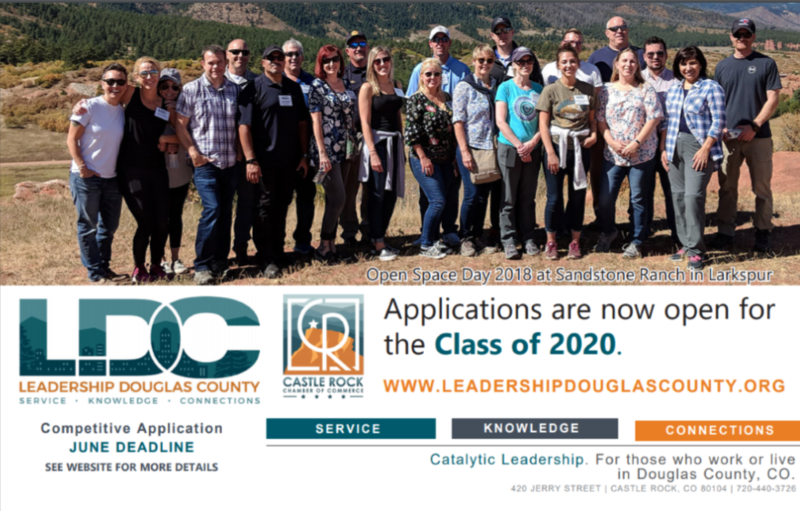 Leadership Douglas County (LDC), a program of the Castle Rock Chamber of Commerce, is committed to ensuring the continuity of knowledgeable and effective leadership in Douglas County. Douglas County is virtually the geographic center of Colorado and provides an enviable blend of quality lifestyle and business environment. Established in 1999, LDC was created to ensure that our community would continue to identify, educate, and motivate current and emerging leaders to improve Douglas County through personal and collective commitment. LDC seeks motivated, capable men and women from diverse professional backgrounds and supports best practices in setting standards of excellence. Session topics throughout the year include: History, Open Space, Healthcare, Aging, Social Services, Civic Engagement, Education, Economic Development, Transportation, Law Enforcement, Fire and Emergency Services, Public Safety, Arts and Culture, Media, along with team-building elements and skills training throughout. LDC conducts a competitive application process. The criteria for selection into the program will be based on: an applicant’s real world and professional background; a complete and thoughtfully prepared application; and a review of applicant’s education, recommendations, and involvement in community service activities. In most years, applicants will not be required to participate in, in-person, interviews with the selection committee. We hope that by participating in Leadership Douglas County established and emerging leaders will be educated on the realities, opportunities and challenges in Douglas County. LDC’s goal is to inspire participants in the work they do; strengthen them and the organizations they serve; and facilitate a heightened sense of community connection through discussion, experiences, commitment and shared values. If this sounds like a good fit for you…please read on.